By August, lawn winterizing products are fairly easy to find in the lawn and garden section of retail stores. This may lead one to think that winterizing is a common practice. There are, however, misconceptions associated with this practice that the following information should help to clarify. First of all, both cool- and warm-season turfgrasses grow in South Carolina, and most winterizer fertilizers do not differentiate between these two categories. Fescue is a cool-season grass and grows best in cool temperatures. In the fall, you should fertilize fescue lawns with a lawn fertilizer according to soil test results. On the other hand, in South Carolina, warm-season grasses such as centipedegrass, St. Augustinegrass, bermudagrass, and zoysiagrass begin to enter dormancy during the late fall. These warm-season grasses can be injured by the effects of fertilizers containing nitrogen if applied in the fall. Many products marketed as winterizers contain a high percentage of nitrogen fertilizer. If nitrogen is applied late in the growing season, it should be done at least 2 months before the first average frost date. This will allow time for the turfgrass to go dormant before cold weather can cause injury. These dates are August 15 for the Upstate and September 1 for the coast of South Carolina. When applied too late and too heavily to warm-season turfgrass, nitrogen fertilizer will promote shoot growth at the same time the plant’s metabolism is slowing. This results in a depletion of carbohydrates and stress on the plant. The new, tender shoots are also less tolerant of cold temperatures. Furthermore, the additional nitrogen will be available to cool-season weeds, and may increase the incidence of large patch disease, which is very prevalent in the fall. Be cautious when using so called ‘weed and feed’ fertilizers as well during the fall. Weed and feed products contain a fertilizer with the addition of a post-emergence herbicide. Many of these products contain a high level of nitrogen that should not be applied in the fall. Unless you are well versed in the use of these products, apply the fertilizer type and rate as recommended by a soil test report; then separately manage your weed problems. Applying the recommended fertilizers during the turfgrass growing season should keep the potassium levels sufficiently high to protect the lawn from cold injury. your lawn is being grown on very sandy soils and there has been excessive rainfall during the growing season, additional potassium applications may be needed. Materials available include fertilizers that are low in nitrogen, such as a winterizer 5-5-25 (use 4 pounds per 1000 square feet); muriate of potash (0-0-60), use 1.6 pounds per 1000 square feet); or potassium sulfate (0-0-50) use 2 pounds per 1000 square feet). However, if your lawn has been fertilized throughout the summer with fertilizers containing 8 to 15% potassium, such as 16-4-8 or 15-0-15, it’s unlikely a fall application would be necessary. Be aware that an excessively high rate of potassium fertilizer can cause foliar burn, may compete with other nutrients for uptake, or may increase turfgrass susceptibility to certain diseases. Excessive potassium is especially known to affect how much magnesium is taken up by turfgrass, which will result in a lighter green turf color. Always apply granular fertilizers onto dry foliage to reduce the likelihood of salt burn. If selecting a winterizer fertilizer containing nitrogen, be sure that the nitrogen content is low, compared to the potassium, which is represented by the third number in the analysis. This will allow you to apply appropriate amounts of potassium without applying excessive amounts of nitrogen. To find the recommended fertilizer rates and times of application for various turfgrass species, see HGIC 1201, Fertilizing Lawns. Furthermore, the fertilizer application needs to be light to avoid damaging the turf. A light application means ½ pound or less of actual nitrogen per 1000 square feet of lawn. 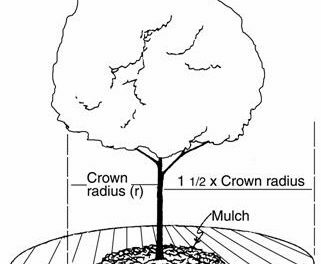 To determine how much of any fertilizer to use to apply a set amount of nitrogen, multiply the number of pounds of nitrogen you want to apply by 100. Divide the result by the percentage of nitrogen in the product, as shown on the label. In a fertilizer analysis, the percentage of nitrogen is represented by the first number. In the above case, ½ times 100 equals 50. For a 5-5-25 fertilizer, for example, divide 5 into 50. The result, 10, is the number of pounds of 5-5-25 that contains ½ pound of actual nitrogen. Besides applying potassium, there are cultural practices that help warm-season turfgrasses maintain optimum health through the winter. One suggestion is to increase sunlight to the turf. Turf in shady areas stays cold longer and produces fewer carbohydrates due to reduced photosynthesis. Carbohydrates are needed for increased cold tolerance. Another suggestion is to loosen compacted soils through aeration or a gypsum application. Compacted soils are colder than well drained areas. 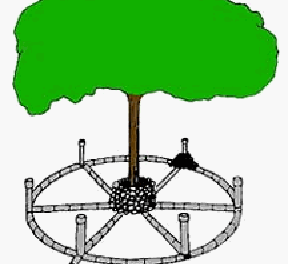 Core or plug aeration should be done in spring following turfgrass green-up. Keep fallen leaves off the lawn, as this will reduce the turf’s ability to photosynthesize for carbohydrate production. And lastly, raising the mowing height in late summer will not only promote deep rooting, but will leave longer leaf blades, which are capable of producing more carbohydrates. An increased height will additionally reduce weed seed germination in the fall before the turf goes dormant. 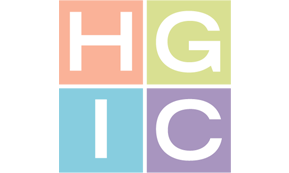 For more information see HGIC 1205, Mowing Lawns. Another important problem that may occur during the late summer and fall is the incidence of turfgrass disease. The fall can be a time of heavy rainfall or at least extended periods of wet weather. This sets the conditions for turfgrass diseases, especially large patch disease. If your lawn has shown a propensity to stay wet during the fall and disease has been a problem in the past, preventative applications of a fungicide may be warranted. The healthier the turf is going into winter dormancy, the healthier it will be at green-up time in the spring. Be sure to control any disease that may appear in order to avoid those brown circular spots in the spring. For more information on large patch disease, please see HGIC 2150, Brown Patch & Large Patch Diseases of Lawns. In summary, a lawn that has been well maintained through the summer is prepared for winter. So, it is important to test the soil annually to correctly fertilize and lime the lawn. If you are concerned, follow the recommendations above and submit a soil sample to your local Extension office. Among other helpful information, the report will include the potassium level of your soil.